Sand mines proposed for the Salinas River near Paso Robles and San Miguel are dredging up core differences in the community’s bedrock values: private property rights versus the quality of life for nearby residents and the river ecosystem. 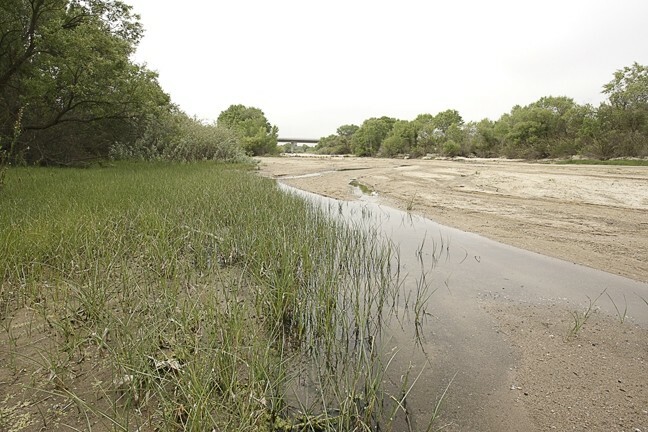 A controversial plan to mine sand for 20 years along a 1.75-mile stretch of the riverbed near San Miguel is the first proposal for consideration by the SLO County Planning Commission, on May 8. Applicant Chad Pankey is asking for a conditional use permit to scrape up to 145,000 cubic yards of sand and gravel from the Salinas River and Vineyard Creek annually during the dry periods. The material would be screened, stockpiled on the riverbank, sold onsite, and hauled off by large trucks. DIG IT : Five sand and gravel mines are proposed in the bed of the Salinas River and its tributaries in the North County, now home to thousands of tadpoles. The county staff has determined that any environmental impacts from that mine operation—and others proposed nearby—can be mitigated to an insignificant level, a decision that’s “not popular in the North County,” according to John Nall, the county’s chief environmental specialist. Nearby residents have appealed the county’s determination, asking for a full environmental impact report that would look at the collective effects of all five mines that are proposed for the area. “There are inherent conflicts associated with surface mining. You have dust, noise, and truck traffic, and people don’t want to live next door to that,” Nall explained. “Everybody’s choosing sides. There’s quite a division in the community. No one is in the middle except county staff,” he added. Deborah Dumar-Lewis, who lives in the new Mission Meadows neighborhood in northern San Miguel, has been circulating petitions in oppposition to the Pankey mining proposal. “I’m just a citizen trying to do the right thing for San Miguel, for the community, and for the river ecosystem,” she said. Among other concerns, she’s worried about the possibility of asbestos and valley fever spores in the dust that would be kicked up from the mining operation and the 64 daily truck trips through the community of San Miguel. “Ten years ago there weren’t any houses here. But now mines are inappropriate development for an area where kids with developing lungs play,” Dumar-Lewis said. Robb Eidemiller of Sierra Delta Corporation is acting as the agent for Pankey and other landowners who want a permit for sand and gravel mining. “[The landowners] have property rights. They’re perfecting their allowable uses,” said Eidemiller. Opponents have not completely investigated the projects, he said. “People are motivated by fear, or by rumors, or by greed,” he added. Sand stockpiled at the mine site can be sold for around $16 a cubic yard, Eidemiller noted. Based on that figure, sales from the proposed Pankey mine could total $2.2 million a year. Add in the four other proposed sand mines, and annual sales could total more than $5 million. “Mineral extraction is an allowable use on land zoned for ag. You can mine sand to derive income from ag land,” Eidemiller said. That’s if a conditional use permit is granted. The mining agent doesn’t believe a full environmental impact report is warranted for the project. Fling Traylor, who owns the nearby San Marcos Creek Winery, is worried that mining the riverbed could change the river’s flow, threatening his vineyards. He’s calling for a full environmental impact report to study all the issues. Some residents said they’ve heard that extra sand is needed for the Nacimiento Water Project—where the pipeline trenches are being backfilled with sand—and the widening of Hwy. 46 East. But that’s not the case, according to county and state officials, since bids and suppliers for those projects have already been accepted. Much of the sand and gravel for both Nacimiento and Hwy. 46 is being provided by Union Asphalt, which has an approved mining operation just north of the county line near Bradley, supplying up to 540,000 cubic yards a year. That mine is located away from houses and away from the riverbed, and is not visible nor audible from Bradley. Trucks leaving the mine do not travel through the town, according to company spokesman Bob Kober. “We sell to anybody. Sometimes we hear that you can’t get sand in the North County, but we sell to anybody, unless they have bad credit,” Kober noted. The issue for SLO County is one of sales tax, according to Randy Ghezzi, the county’s road maintenance division manager. If the county buys its sand and gravel from outside the county, “the tax dollars are not staying at home,” Ghezzi said. But winery owner Traylor questions whether any sales tax collected from new North County mines would cover the costs of road maintenance and mine inspections. He and many other North County residents are planning to attend the Planning Commission meeting on May 8, where commissioners can either approve the proposed Pankey mine, require a full environmental impact report, or delay a decision. Any decision the Planning Commission makes can be appealed to the Board of Supervisors. New Times correspondent Kathy Johnston may be reached at kjohnston@newtimesslso.com.